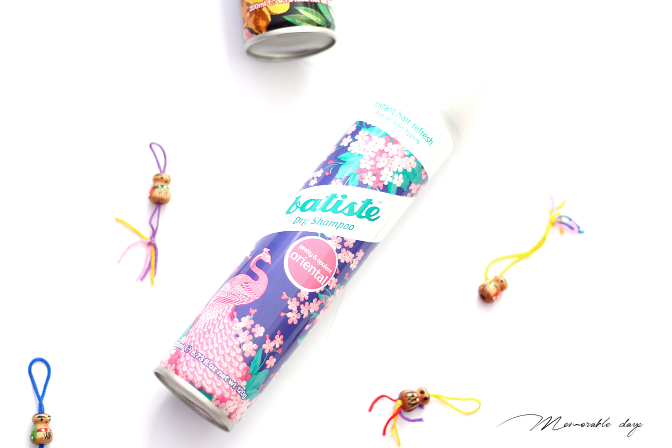 Review: Batiste Oriental Dry Shampoo | Memorable Days : Beauty Blog - Korean Beauty, European, American Product Reviews. 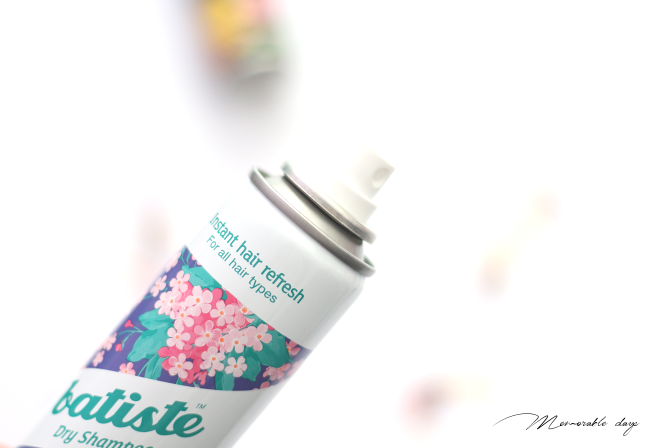 You must know the brand Batiste by now since I have mentioned it multiple times on blog already. Batiste is one of my favourite brands that sells dry shampoos. It's also the #1 dry shampoo in the UK 3 years in a row. They keep on releasing different kind of scents with colorful packaging which makes you want to try them all! 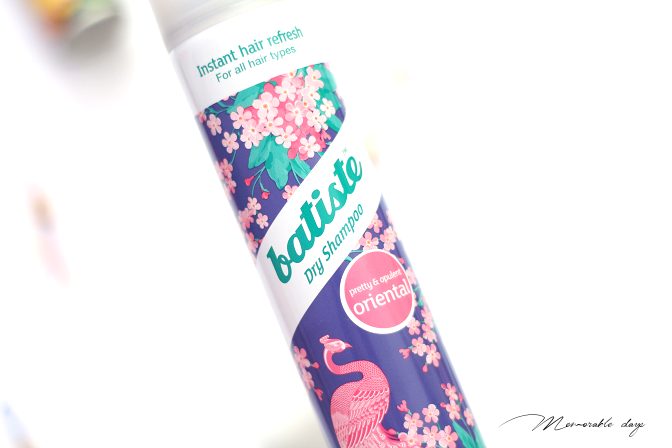 In today's blogpost I will share my thoughts about Batiste Oriental. It doesn't matter what your hair type, colour or style is, Batiste Dry Shampoo instantly refreshes, banishes oily roots and gives dull, lifeless hair the makeover it needs without any water. That's right, goodbye oily and greasy hair! Once you spray it on, it feels clean and fresh and it stays like that for the whole day. Girls who are washing their hair every single day (and I used to do that too), there is no need to do that now and it's extremely bad for your scalp to wash it every day as well. Just use dry shampoo and you can skip your washing day. I just love their dry shampoos because it's easy to work with and it actually works! The formula for their Oriental version isn't different, it is the same as all their dry shampoos with a white cast when you spray it. The difference is the scent and packaging. The Oriental fragrance has been formulated with tones of wild berry, jasmine and sandalwood that will infuse your hair with the exotic aromas of the Orient. Shake the can well before you use it. Keep the nozzle about 30 cm from the hair and spray into your roots then. You will see a white cast when you spray it. Massage through with fingertips and the white cast will be gone. Brush and style and you are good to go! Batiste dry shampoos can be purchased in The Netherlands at Kruidvat, Etos and Trekpleister. In the UK you can find it at Boots and Superdrug. I have always been loving Batiste dry shampoos. Now I am not a big fan of scented products, but I don't mind it on hair products, because hair gotta smell good at all times right?! My biggest favourite of their whole collection got to be the cherry version because of the scent and it works great on my hair; it gives great volume and texture to my hair and it removes my oil instantly! I love it! Great for the lazy days when I don't want to wash my hair and when my hair looks a bit greasy. The Oriental version works exactly the same. The scent of the Oriental version smells fresh and I can actually smell berries and a hint of jasmine when I spray it. Do keep in mind that the scents are a personal preference and the scents can be a bit overwhelming to some. For some versions they do provide travel sizes, so if you are not sure about it yet, try it with the smaller can first and see if you like the scent and how it feels on your hair.